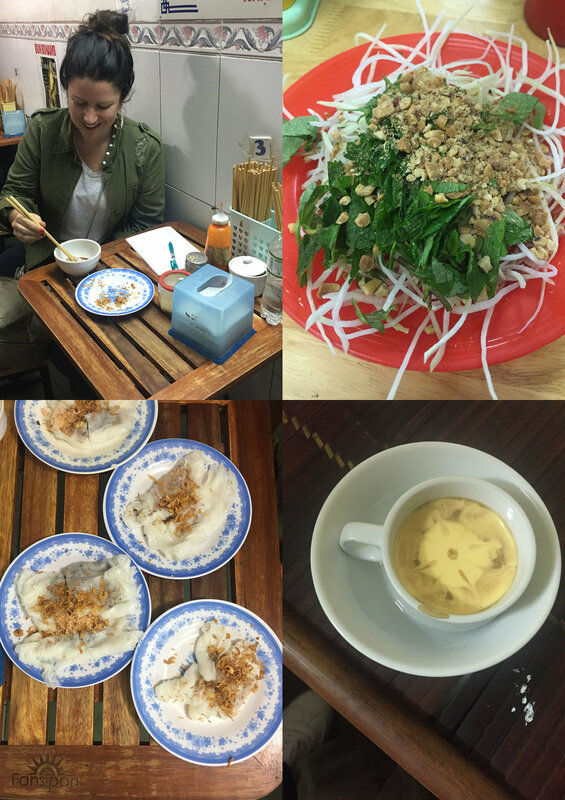 I had been in touch with Hanoi Street Food before I arrived in Vietnam, and they had offered me a complimentary vegetarian food tour. I decided to take them up on this on my first night in Hanoi. It meant that I got to try lots of different things, safe in the knowledge that I wouldn't end up accidentally eating pork / fish etc. The tour turned out to not be a specialist one (although they do do them when they have enough people), and I just joined a group of 6 mainly meat eaters on a route around the city, but at each location I was given an option I could eat. It was loads of fun, the guide was friendly and I ate some delicious and super fresh food. Despite photographing every dish and location. and writing it all down meticulously I would honestly advise to just join the tour. We weaved through busy lanes and along dark corridors and up lots of stairs, I wouldn't know how to direct you if I tried. We ate at 7 different venues and I was full to bursting by the end, for that reason I would recommend the walking tour over the motorbike tour (I'm worried I'd have wobbled off!)! My favourite place to hang out in this crazy city was the uber chilled Hanoi Social Club. The ambience, the food, the cocktails and the music were all ace. I had a fantastic curry and a well-mixed cocktail and I thought the price was reasonable. If you are only in Hanoi for a night or two, and want guaranteed good food and a relaxed vibe then head here. Caters for vegans and meat eaters too. The State Run Food Shop (Cua Hang An Uong Mau Dich So 37) has mixed reviews online, but I ate the most delicious vegetarian food here. It's a cosy place with an interesting decor tucked behind the West Lake. I went with a friend, and we ate garlicy squash, mounds of steaming cabbage, and slices of spicey potato, all with a sticky rice cake. I had been recommended Jalus by my friends Walk Sew Good (go look them up, they walked 3500km though SE Asia). They had raved about the gnocchi but I went for a curry instead. It was tasty and the food coming to other diners also looked good, but the real treat here are the fresh juices and smoothies. Extra points for serving them with reusable bamboo straws. I went for a late lunch early dinner at Minh Chay (56b Hang Gai) and as a result it was totally empty when I arrived. Still, the wall of decorative plates and the varied vegan menu were enough to encourage me to sit down, and I really enjoyed my mushroom clay pot and spring rolls (although the fake fish sauce was so authentic I coudn't eat it). Since I was there they have opened another restaurant that looks great. A good reason to book a flight back to Hanoi I think. Favoured by ex-pats living in Hanoi, Maison de Tet is a beautiful house by the West Lake. There rooms are full of amazing antiques and rare textiles, and the views of the lake are beautiful. On the night that I went there was rather alot on the menu that wasn't available and the service was slow (even for someone who really wasn't in a hurry), but when the food turned up it was great. The brunch menu looked delicious and they have a brilliant range of coffee, so next time I'm in Hanoi I'll make sure to start my day there. Tucked down a little lane is the wonderful Tranquil Books and Coffee. I popped here when wandering the streets of the old town and had a very enjoyable coffee and cake. You're encouraged to keep noise to a minimum, which suited me perfectly. I didn't eat at Cong Caphe but I spent many hours in the one opposite St Joseph's Cathedral, painting the view from the window (infact you can buy a print of it here!). I can really recommend the frozen passionfruit juice, delicious! To read more about my trip to Hanoi visit my post here that talks about where I stayed (the Hotel was just brilliant!) and what I saw, and go here if you want to read my Fashion & Textiles tips. I'd love to hear what you think about this post, do leave a comment below!